When I was in university, I practically lived off of macaroni and cheese and by the time that I was done I was so sick of it that I have not really touched it since. I recently came across the description of a crab mac and cheese in a menu that sounded so good that it convinced me that it was finally time to make macaroni and cheese. While I was contemplating the crab mac and cheese recipe, I kept thinking about crab cakes and eventually I decided to go with the idea and thus this crab cake mac and cheese was born. One of the first questions that needs to be answered when making mac and cheese is: ‘What kind of a sauce do you want?’ and I decided to keep things simple and went with a bechamel sauce and in addition to the milk I added some cream to make it a bit richer. The next question that you have to ask is: ‘What kind of cheese do you want?’. When choosing a cheese you want to choose a cheese that is tasty and a cheese that melts well. I was thinking that I wanted to keep this mac and cheese white and that I did not want a cheese that was too strong in flavour that it would completely overwhelm the crab so I went with a gruyere and to that I added a bit of fontina which melts well. Continuing with the crab cakes concept, I seasoned the sauce with old bay seasoning, mayonnaise and a generous hit of grainy mustard. Crab cakes are generally made with bread crumbs and so I decided to top the mac and cheese off with a crunchy layer of panko bread crumbs. The crab cake mac and cheese came together easily and it exceeded even my wildest expectations! It was nice and creamy and cheesy and just packed with flavour. The gooey melted cheese was amazing and the flavour of the crab came through well. This mac and cheese may be a bit decadent but it is so worth it! I particularly liked the way that the grainy mustard worked in it adding a bit of crunchiness. My aversion to mac and cheese is officially cured and I already have a few more ideas for some different recipes. Mix in the flour and cook until it turns a light golden brown in colour. Add the milk and cream and cook until it thickens, about 3-5 minutes. Add the old bay seasoning, mayonnaise, mustard and season with salt and pepper. Mix in the gruyere and fontina and cook until it melts. Mix in the pasta, crab and green onions and remove from heat. Add the breadcrumbs and toss to coat, remove from heat and mix in the parmigiano reggiano. Pour the mac and cheese into a baking dish and top with the breadcrumbs. Bake in a preheated 350F/180C oven until golden brown on top and bubbling on the sides, about 20-30 minutes. Take a look at the Presto Pasta Nights roundup on The Crispy Cook. I had never ever considered this combo before but it sounds amazing! I have to say, crab with cheese never even entered my head before but I'm intrigued enough to think about trying this sometime! Thanks for sharing the recipe 🙂 I started following your blog probably not more than a month ago but am so glad that I did! Oh My! You had with the Crab but when I saw the cheese you used forget it. It sounds really good. I am bookmarking this one. Thank you for sharing. This version of mac and cheese sounds amazing! I have read different recipes where they incorporated crab or lobster, but I haven't seen the incorporation of crab cake ingredients…genius! I love most of the recipes you post, but if you're dissing Kraft Dinner I will cut you. mmmm I love crab (and even lobster!) in my mac and cheese! I love crab mac and cheese. We have a local restaurant named Avalon that has this on the menu and it is sooooo rich and delicious. Thanks for sharing! I just had a mac and cheese with lobster at a cooking class that was amazing. I was thinking when I was eating it that it would be equally delicious with crab…and voila….there your recipe was. Fabulous! This sounds quite tasty. I must try it! This is sheer torture, Kevin! You had me on the Mac n Cheese, to add crab is sheer joy!! This sounds really decadent. Thanks for sharing it with Presto Pasta Nights this week. You go Kevin! If you made it I would eat it! Did you get a chance to check out mine? This recipe literally took my breath away! I might have to move in with you for this recipe! LOL Nicely done! A delicious combo! At home we ate a lot of seafood Mac & Cheeses. Now this is a decadent mac and cheese. oh my goodness. I'm a craboholic (and carboholic?) so this must be the perfect intersection. It's on my list for this weekend, thanks!! You've got another winner here, Kevin! What a fantastic combination of delicious cheeses, crab meat, and seafood seasonings. I love how you adorned the mac & cheese with a big ol' crab claw! I had just seen a recipe for lobster mac n cheese somewhere and now this crab – so I am feeling very boring. Gruyere and fontina? Interesting combo – a little sharp with a whole lot of mellow. Do like the crab cake conception. This is very intriguing and your description sure does have me drooling. I love the ingredient list, a must try. What an upscale recipe Kevin, that looks out of this world. Mmmm…nothing sounds better than ooey gooey cheesy goodness! With tons of flavor! This was great! Made it tonight with slight alteration (due to what was on hand). Lucky enough to live on the Pacific coast and we're having a good crab season, Ya-Hoo! Thanks for inspiring dinner tonight! Amazing creation! I can't wait to make this for my family of mac 'n cheese and crab lovers. 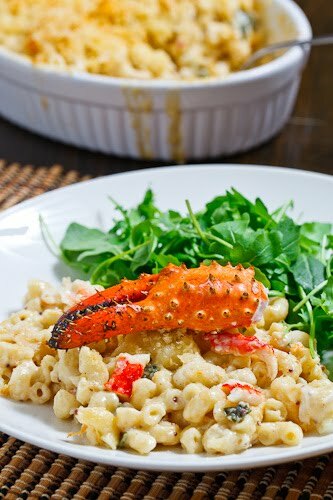 I've made lobster Mac & Cheese, but never thought to use crab. I'll try this–maybe for New Year's Eve. Now that is definitely a gourmet take on a classic! Perfect for the dungeness season right now too. Add a drizzle of truffle oil…..and this highlights all that is great about the Pacific Northwest….yummmmmm! Serve me up a portion. Crab mac & cheese – oh yeah! thanks for sharing. looks wonderful. i think my 11 yr old would love it too. This recipe looks awesome and I can't wait to have it. this crab mac and chesse must be very very delicious. I can't wait to try it myself! !